Our pre-owned electric scooters come with a 6-month limited warranty. The E-twow Booster electric scooter is a Lightweight Electric Scooter. Skillfully refurbished by our team of engineers to a "like-new" condition. It comes at a cheaper price and even has a 6 months limited warranty. The E-TWOW Booster v2 or ETWOW Booster Plus is the latest electric scooter that will replace the Zoom Air 2. The old model was well loved by our Road Warriors due to its slim profile and the ease of trolleying, which made it perfect for public commuting even during rush hours. 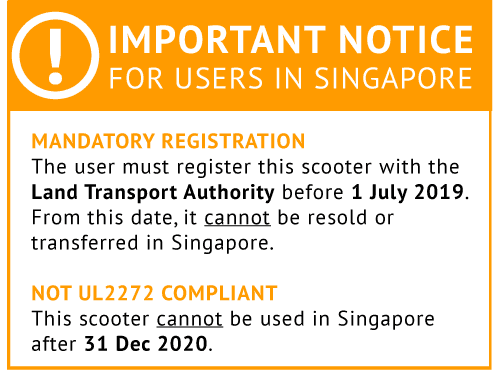 The new E-TWOW Booster e-scooter takes it one step further with new upgrades. The new charging port on the E-TWOW Booster Plus is now water resistant and there is no more sparking occurrences with the newly designed charging port. Side bumpers can also be found on the new E-TWOW Booster Plus to eliminate dust and rusty screws and also enhancing the overall appearance. The new colored is extremely refreshing to look at as compared to the old black and white throttle. The wider and thicker deck adds more leg room and stability for rider and room for a bigger battery for future upgrades. The ETWOW Booster Plus comes in adjustable heights with front and rear suspension to make all uneven terrain manageable. The E-TWOW Booster Plus features a foldable handle with an improved ergonomic handle grip for the entire palm to be rested and an integrated rear tail and brake light for overall visibility and safety. The ETWOW Booster V2 also comes with a front electromagnetic brake and rear manual+electric brake. Both brakes are equipped with the Kinetic Energy Recovery System (KERS) commonly used in Formula One which helps to recover kinetic energy to recharge the battery. Check out the review of the ETWOW Booster Plus in comparison to the Zoom Air 2.